started up last week, I was eager to review them and see what sort of impact they would make. It was not like there were new D.J.s and there was a big overhaul. In fact, it was a case of a bit of a shift and putting the D.J.s we all know and love in new time slots. I loved the new line-up because it was different and I think this year needs to be fresh – it is great listening to your favourite station but a change is a good thing. I was full of praise for the new assortment and felt that each presenter added their own stamp to their new shows. Shaun Keaveny was moved from breakfast to the afternoon and, despite a few minor slips on the first show, it was a brilliant introduction and he has really taken to it. I love his new show and Keaveny sound refreshed and revitalised. I am not sure how long that energy will last but it is a good switch. Lauren Laverne has stepped into breakfast and moved from her morning show. She has, again, taken to this post and has made the show her own. I love her new show and all the fresh features make it really exciting. Mary Anne Hobbs moved from weekend breakfast to weekend mornings and she has a chance to shine. Not that she lacked sparkle before: it is harder to get noticed on weekend breakfast and this means she has more time to wow the nation. There have been a lot of debates regarding gender equality in radio and whether it matters whether we have an equal spread. I remember there were grumbles when it was announced there would be a woman helming BBC Radio 6 Music breakfast. The moves that have been made this year are not political or designed to fill quotas. Instead, it is a case of recognising some incredible talent and making some necessary changes. BBC Radio 2 had a change and there have been some big moves. Chris Evans has gone to Virgin Radio and Simon Mayo departed his evening show with Jo Whiley. Many grumbled and blamed Whiley when Mayo left but it was nothing to do with her and his decision. I was pleased, therefore, when I heard Jo Whiley had been given the 7 P.M. slot on BBC Radio 2. She had been getting relentless abuse from people regarding Simon Mayo leaving the station and that affected her. Her new show started brilliantly and I feel she should have been given that slot earlier – keeping Mayo but giving him his own show. That is all in the past but it was exciting to hear a refreshed Whiley take to her new show and welcome the listeners in. I am interested to see how the show develops but it is her connection with the listeners and the great music that will bring new people in. A lot of evening shows are too gimmick-heavy and do not really play enough music. I think Whiley has a perfect blend between listener interaction and the tunes. Despite the fact she only has a couple of hours – maybe increase the show to three hours?! – it was a great show. Trevor Nelson also has his Rhythm Nation on BBC Radio 2 from 10 P.M. and he is an important part of the new line-up. Whiley opened her show with Buffalo Stance from Neneh Cherry. I think it is the best opening song from all the presenters’ shows – including those at BBC Radio 6 Music – and announced her show in style. There was a nice mix of classic songs/artists – including James and Buzzcocks – together with classic cuts from Beyoncé and Arctic Monkeys. It was Dave Grohl’s fiftieth birthday yesterday so Whiley played some Foo Fighters (Everlong); she spoke with Mark Ronson from L.A. and, among the other songs played, we had A Tribe Called Quest, Lucy Rose and Sister Sledge among the pack! I do not always tune into BBC Radio 2 because the music can be a bit so-so and I find BBC Radio 6 Music is stronger. Whiley’s show was rock-solid and I do not think she put a foot wrong with the songs. A lot of D.J.s go a bit safe and obvious but she played some terrific songs; they were all programmed right and there was that just-right sonic blend. She sounded more relaxed and happy at the mic than I have heard for a while and it was a triumphant opener. Maybe the music will become a little less sh*t-hot today and this week but I doubt it! By a final tine from Four Tops, it was the end of the maiden show. Given the quality of music played and how entertaining Whiley was; I wonder whether there will be a chance to extend the show at all. In any case, it was a great show for those who were relaxing from a hard day and chilling out. I do not usually tune into that time slot on BBC Radio 2 but I think Whiley has changed my mind! Turn back the clock to 5 P.M. and we had Sara Cox take to drivetime. It was great to hear Cox hand over to Whiley and two great female broadcasters stand next to one another. I shall come to the subject of gender at the end but, like Whiley, there were eyes on Cox. Her appointment, I think, was a great one and there needed to be a change to drivetime. I think she did brilliantly in her old show position but I always felt like she was not given the platform deserved. Her music selections have always been ace and that was continued on her first outing yesterday. I looked at some little video clips Cox posted before her show; her walking into Wogan House and high-fiving people; smiling and cheering and, at the end, walking into the studio to have Jeremy Vine tell her she was five hours earlier! Like Jo Whiley, there were some great little bits with the listener and it was an interactive show. So many D.J.s are quite closed and do let people in: Sara Cox was energised and eager to have the listeners take part and get involved. She has been on radio for years so we knew she’s be great but she sounded completely natural in the drivetime role. The opening track was Sisters Are Doin’ It for Themselves from Eurythmics and Aretha Franklin. Maybe it was a bit on the nose but it was a perfect anthem to open up the show and a classic belter. The quality of the show is vital but I think it was a big moment for the station – a female D.J. hosting this slot – meant a lot of eyes were Cox’s way. She was funny, charming and her usual self. The first song was a bit of a nod to Zoe Ball – who I shall mention later – and the remainder of the music was top-notch. I think it was pretty level in terms of quality with Jo Whiley and there was that mixture of the big hits and some rarer cuts. One or two dodgy songs filtered in – Ed Sheeran and Kygo were in there – but all the other tracks were awesome. Sara Cox fans know she likes her 1980s music and we had some classic Madonna (Express Yourself) and George Michael (Faith). She is currently on the air doing her second shift but the opening show as another success. I read and saw interviews she gave leading up to the show and she confessed her nervousness. That is only natural and, when you follow someone like Chris Evans, there are going to be nerves. Many were sad to see Evans leave and wondered whether anyone could fill the void. Evans starts his new show next week and there were a lot of media bodies waiting for Ball as she walked into Wogan House to start her first show. She had teased us about the opening song and it was clear a lot of thought went into the selection. Aretha Franklin’s Respect opened the show and it was a great shout. Not only do its messages seem to make a point – give her some affection and respect her in this new role – but it was a powerful wake-up. There is a new team on the breakfast show. Tina Daheley, Mike Williams and Richie Anderson join Ball and they have an instant chemistry. I think Daheley especially shines and is perfect on the news. It is good to have this team together that sounds close and have that affection for one another – rather than one assembled by a committee. The guys all posed for photos prior to the show and if there were any nerves then I couldn’t tell. 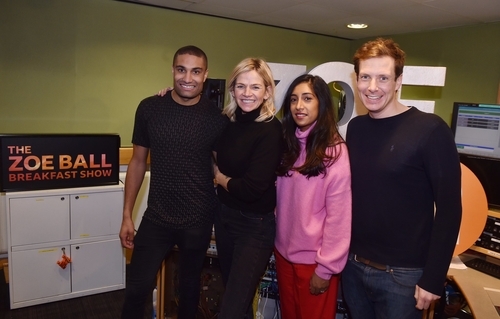 The @zoetheball Breakfast Show is here! Ball welcomed the listeners in and there was this slight sense of trepidation – although you knew she would smash it. The first segment of the show was female-heavy and the fact Rita Ora was played after Aretha Franklin set the tone. The first caller to the show was a woman and Tina Daheley was the first of the new support crew to speak. It makes a change from a lot of the male-heavy breakfast shows and I wonder whether we will see these changes spread to other networks this year. I will talk about the music and moments but The Guardian had some kind words about the first Zoe Ball Breakfast Show. “As it dawned that she was now in the line of succession to Terry Wogan and Chris Evans, Ball’s pulse could almost be heard thumping under the opening link at 6.30am. But in the next three hours, she was confident without being cocky, stumbling verbally only once after the Radio 2 “bosses” turned up behind the glass. The arrival of managers seems to have, even for a rare employee earning more than her employers, much the same impact as on a factory floor. The first show also felt deliberately calculated to thwart reporters seeking stories of broadcaster rivalry. Ball revealed that Evans (who starts his new Virgin Radio breakfast show next Monday) had sent her a “lovely” good luck text, while Cox – who finished second in the race to replace Evans before being given the consolation of drivetime – phoned in from her dog walk to compare first-day nerves. “You’re going to smash it, gorgeous. Love you!” said Ball, to which Cox replied: “Love you, babes.” David Dimbleby and Fiona Bruce did well to avoid such a handover on Question Time last week”. One thing we can rely on when we talk about a D.J. like Zoe Ball – Sara Cox and Jo Whiley too – is the fact they will be professional and have that experience. Ball is no stranger to the radio game but the BBC Radio 2 breakfast slot is a big one. She spoke to John Cleese who was warm and witty. Cleese can sometimes be a bit guarded in interviews but he gave Ball good value and was keen to open up and chat. Ball showed how easily she could connect with her public and the new listeners. This rapport and connection meant it was a smooth and easy-going show. I wonder how big the listener numbers were for the opening show because I can imagine a lot of people tuned in just to hear this big unveiling. There was only one slight bump. The BBC bosses appeared behind the glass during the show – just to see how it was going – and it must have put Ball off her guard for a bit. It is a good gesture but I think it is like someone standing over you when you type! Ball was fine and, apart from being a little taken aback, she cracked on with what she does best. I am not sure whether she is going to get used to the 4 A.M. wake-ups – or just after – but there were no signs of bleary eyes. Some have said the rapport was too ‘young’ at times whilst others claim some of the music was a bit ‘old’ – it was the review I just quoted, actually. I feel Ball is a very young and cool listener so she is quite natural when being a bit more ‘down with the kids’. There are a lot of young listeners tuning in so it is only right the tone would reflect this. I like the fact the show was not stuffy and there was a cooler, more relaxed edge. The music was fine too. BBC Radio 2 does play ‘older’ music because its demographic expects that. It was not going to be all chart bangers so the fact there was some Phil Collins in the mix was great. Breakfast is about waking you up and providing a kick but there are those who want some chill and a chance to hear some classics. The features on the new show included Show and Tell and Seven-Second Shout-Out. The former welcomed young listeners in to broadcast their talent to the nation. There was an interesting mix of sounds on the first breakfast show. Cher’s Believe and Coldplay’s Adventure of a Lifetime made it into the show and there was no leaning towards one genre or another. The fact we had Rita Ora and Silk City alongside The Cardigans and Stevie Wonder meant all the age ranges were catered for. Maybe there were one or two tunes that divided listeners but the selection was broad and interesting. New tracks from Fleur East and Sam Smith mingled with The Human League – Phil Collins popped up again to end the show. One was not expecting a radical change regarding the music and tone because it is BBC Radio 2 and the breakfast slot needs to have that balance. I like the fact Ball got to have an input regarding music and it was not just a cut-and-paste playlist. Chris Evans was very hyped and restless regards a presenting style whereas Ball favoured a more relaxed and subtle approach. There was plenty of enthusiasm from her and the team but the emphasis was very much on the music and the listeners. The first show would have been a miss were she to talk too much or copy Evans. Ball managed to come in and offer her own style: a balance of warm and friendly nods to the listener but ample interaction with her new team. Maybe some of the features will take a while to settle but it is nice to hear the public included right away. Maybe something music-based like BBC Radio 6 Music’s features would be a good idea but it is early and there is time for development. Some classic anthems from Fleetwood Mac – Little Lies – and Madonna - Vogue – spoke to me and I loved a bit of Divine Comedy (National Express). The social media reaction to the show as generally positive and people were excited to hear Zoe Ball in the breakfast slot. I think her tenure will be long and successful and I like the fact there is an experienced and popular pair of hands at the decks. Evans was a great host and had his following but it was time for a bit of a change. We've all had those dreams before our first day in a new job! I have spoken about the changes and the fact that, on BBC Radio 2, female D.J.s are filling the biggest shows. That triple-threat of Zoe Ball, Sara Cox and Jo Whiley is great and they have all earned their place. There has been some criticism and snottiness – Jeremy Clarkson was especially ‘direct’ – regarding the appointments and the fact that it might have happened to make the station less male-heavy. All the D.J.s already worked on the station so it was not like they brought in new women from other stations. Having Zoe Ball at the breakfast helm was natural because we all know and love her work and she offers something different and fresh. There are no male names I could think of to fill the position so there is no complaint there. Drivetime needed a female host and it has been occupied by men for years and years. I feel like partnerships can be risky and fail so having Sara Cox present it solo was a good move. She has the energy and wit to carry it on her own and, again, there are no male D.J.s on BBC Radio 2 who could do a better job. Jo Whiley was great in that later slot and I have often wondered why she did not get the call sooner. A lot of the big shows are still occupied by men – Ken Bruce and Steve Wright – so it is not like female D.J.s have taken over! Thanks for being such a brilliant guest this morning, @JohnCleese! THEY were born to host these shows!